Are you a person who has to climb something “because it’s there”? Despite my focus on plants on this trip, there is still a part of that mentality inside me which is difficult to shake. 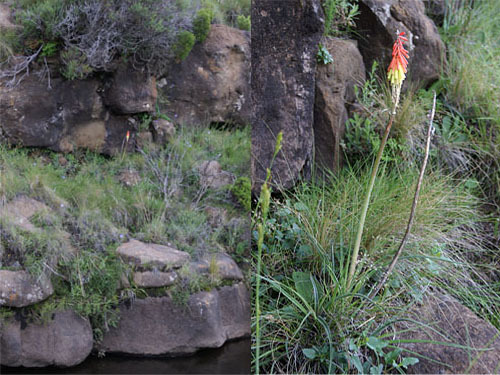 So when I had found all the Kniphofia I was wanting to find at Rhodes by 11 o’clock this morning, there still lay before me the temptation of the highest peak in the Eastern Cape: Ben Macdhui. My body felt the lack of oxygen at these high altitudes, but it was worth the climb for the views into Lesotho and to observe how the vegetation changed so suddenly as one reached the windswept top. 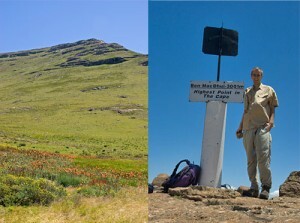 It is a tough life for a plant at 3000m altitude in South Africa: wind, drought, snow, and scorching sun. Surprisingly, there was still a lot of colour, even if most of the plants did not get more than a few inches high. As you will see from the above photograph, there is an orange glow on the lower slopes (I say lower, they were still around 2500m) of Ben Macdhui caused by a fine population of Kniphofia caulescens. One of the few species with a stem, it tends to produce large colonies with glaucous foliage. 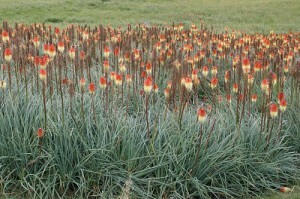 This makes it an attractive plant for the garden even when it is not in flower. However, it is clearly quite variable, as the leaves of this population were almost grass-like, whereas most of the plants in cultivation in the UK have much broader leaves. 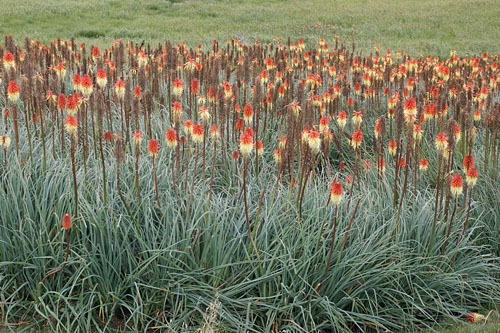 A Ben Macdhui speciality is Kniphofia hirsuta, the only Kniphofia with hairs on its leaves. 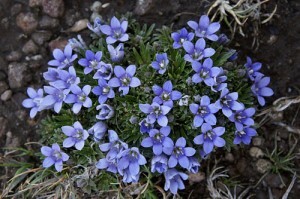 It is a true alpine species, not found below 2400m, with short spikes and low arching leaves. In stark contrast to the preceding species, Kniphofia hirsuta formed isolated plants of a few rosettes. The species had finished flowering on the slopes of Ben McDhui itself, but a lone spike remained next to a stream lower down. Plant of the day: Craterocapsa congesta – this dwarf member of the bellflower family, Campanulaceae, formed ground-hugging cushions that reminded me of gentians. I only saw it on the rocky peak of Ben Macdhui. 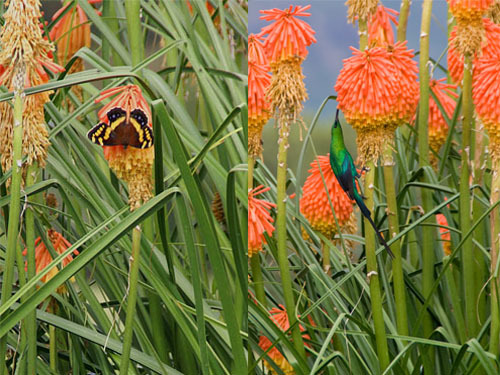 Pollinators of the day: not only do red hot pokers have beautiful flowers but they are matched by their native pollinators too, the mountain pride butterfly and the malachite sunbird. I was able to watch both of these carrying out their duty on the plants in the garden of the Walkerbouts Inn where I am staying. Ben Macdhui, butterfly, Craterocapsa, Kniphofia, pollinator, Rhodes, sunbird, Tiffindell. Bookmark.